Completing the Social Security Disability application is the first step toward receiving benefits. A lot of information is required in this form to help the Social Security Administration make an informed decision on your disability claim. 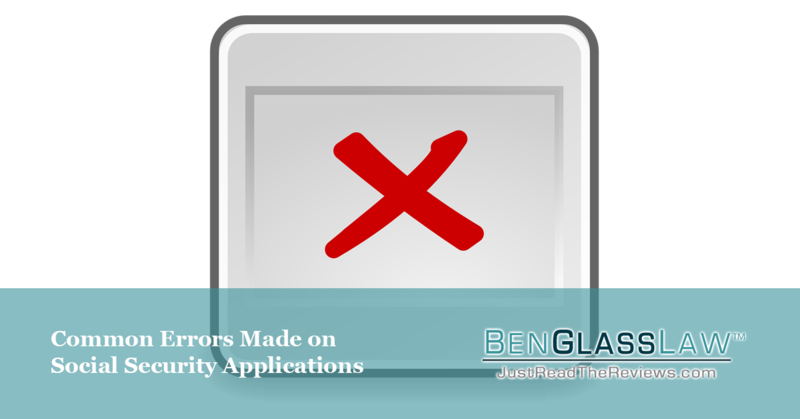 Common errors include incomplete information, incorrect information, and missing application deadlines. The initial application is the first stage to tell the SSA about your condition, so it is important to be detailed, mention all limitations big or small, and the mental limitations of your disability as well. The SSA uses information provided to gather other medical documentation up to a year before your condition began. If any important names or dates are missing, they will be unable to find critical documentation proving your disability. Forgetting information also hinders their ability to prove your disability. A complete list of conditions, names, and dates is required to increase your chance of approval. Filling names or dates incorrectly also hinders your chances of approval as the SSA will not be able to find proof of disability. On questions that do not apply to you, simply write "N/A." Many times additional information is required and must be turned in by a specific date through the mail. Failure to send information by the date listed on a letter can lead to denial of benefits. Make sure to be prompt with deadlines and do not rush filling out applications. If a mistake is made, corrections can be made and additional information can be sent later on. For help on applications and information on deadlines, please call (703) 584-7277 or contact a local Social Security office.